Pop-Up Daffodil Cart: Saturday April 13th - Baby Point Gates B.I.A. Daffodil Month, held every April, is Cancer Awareness month. Through this ‘Daffodil Month’ campaign (in combination with year-round fundraising efforts), the Canadian Cancer Society raises funds to help people with cancer live their lives more fully. This year, in support of CCS’ #DaffodilCampaign, Baby Point Gates will be hosting a Pop-Up Daffodil Cart. 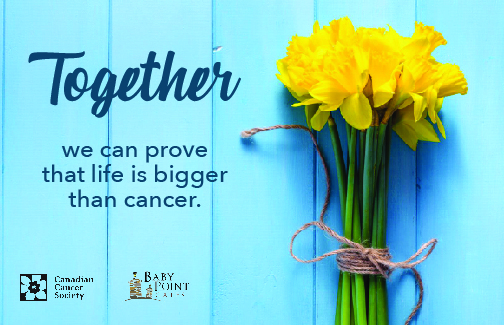 On Saturday April 13th, you can stop by the Baby Point Gardens Parkette (Jane St. and Methuen Ave.) to purchase some fresh daffodils and help us prove that Community is bigger than cancer!